We went to a party at the Oakland Columbarium last night. It's a warren of tiny rooms, connected by passages, each containing walls loaded with ashes of the deceased. Our friend Kelly Porter was live-painting in the Meditation Chapel, and many other video projections, musical acts, and exhibitions were scattered throughout the space. The party was a little subdued overall. The space was gorgeous. We spent the first 20 minutes or so making our way up to the Garden Of Revelation, via Devotion, Bethel, and Rest. Each of the garden areas is vertically offset from the previous, which gives the entire space a stairstep feeling. These are connected by tiny staircases, and end in the Revelation, a tall open space with "cat walks" one story above ground level. I think the entire building is sunk into a hill, because we could see trees draped over the skylights in the uppermost rooms. 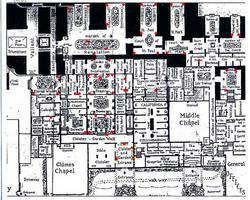 I felt as though we had seen it all, but looking at the floorplan afterwards it's obvious that a whole section of the building (centered around the Middle Chapel) remains unexplored. This is an absolutely stunning building by Julia Morgan that deserves a return trip. 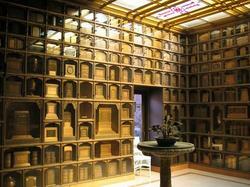 Update: Peter has a set of Columbarium photos on Flickr.